Appleby Environment objections can be downloaded here. Appleby Environment objections to 18 01443 FULM. This map shows the extent of the proposal in comparison to the size of Appleby. Its impact on the countryside is clear. Please lodge your objections now. The official deadline was August 28th but officers are likely to continue to accept your objections until the application is determined. See below for how to view the application and its over 120 associated documents. You can submit your objections online (need to register first) or via email (or post). Make sure you say that you object (assuming you do!) otherwise your submission may just be treated as comments. Stress what is important to you and where possible use your own words and arguments as this will carry more weight. You can also copy your objections to our district councillor Richard Blunt (richard.blunt@nwleicestershire.gov.uk) and to members of the planning committee. There is a handy app on the NW Leicestershire site which gives all their emails in a file which allows you to send messages via mailmerge. It is also important that your objections are on valid planning grounds. The relevant document is the recently adopted NWL Local plan which you can find on their website. This defines the land in question as countryside (outside existing settlements) where specific planning policies apply. The developers said in their exhibition that it wasn’t ‘green belt’. 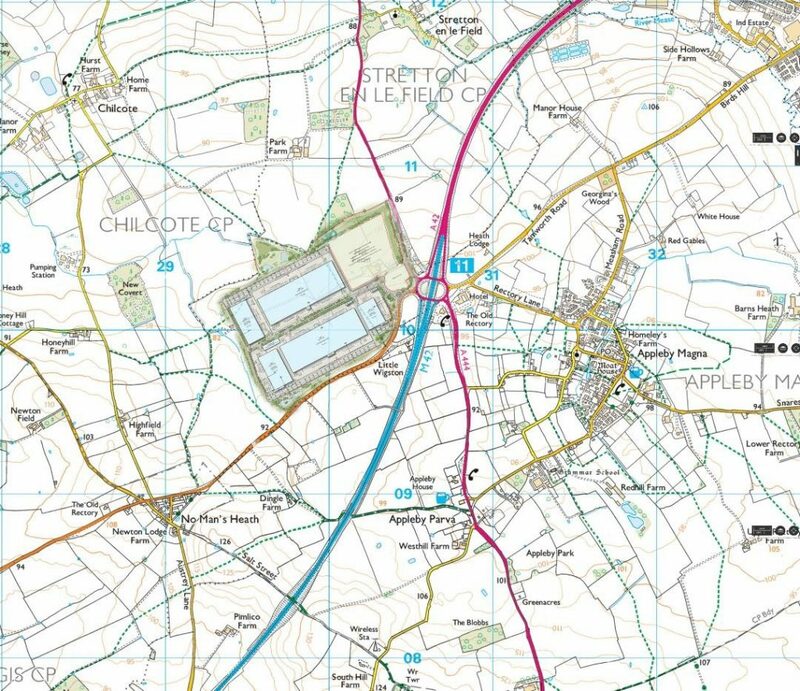 Nowhere in NW Leicestershire is green belt because this applies to the edge of large urban settlements. But it is countryside where development is not normally permitted (policy S3). There are some exceptions but this development does not meet them. Nor does it meet the criteria for a new employment site (policy Ec2). There is no evidence of need. There is a formal process for assessing need which councils have to follow. All 9 councils in Leicestershire issued a joint statement in March 2018 as part of the strategic joint plan to say that they had met the identified need for employment land. NW Leicestershire has contributed significantly to this particular type of development through the allocation of land near E Midlands Airport / Junction 24 M1. There are no sustainable transport links. It is a condition of new employment sites and any permitted development in the countryside that they should be accessible by a choice of transport including sustainable transport modes. For employees this normally means bus routes, for freight it would normally mean rail links (as there are at Airport site). There is no rail link to the proposed site which means all goods will need to be moved by HGVs. There is no current bus route to the site. Employees can be expected to come from a wide range of locations meaning that it is not plausible to put on buses that will take the majority of employees. The developers acknowledge this in their allocation of 2235 parking spaces in their application. It does not safeguard or enhance the landscape. If development is permitted in the countryside it is a requirement that it should not degrade the landscape (policy S3(i)). The relevant landscape is defined as Mease / Sense Lowlands by Natural England (the designated Government body). The landscape is defined as remote, rural and tranquil. The proposed development would destroy this through the loss of arable farmland, construction of buildings which are inappropriately large and of unsuitable appearance to their setting, and the creation of a new built area out of scale to nearby settlements. The application has now been submitted. You can view the details on the NW Leicestershire website. This is the link to the introductory page – you need to tick the terms and conditions box at the bottom and press continue to proceed. Then put the application number 18/01443/FULM into the search box to be taken to the application documents. To make comments online you need to register and log in. But you can also email or post your response direct to the Planning Department at NW Leicestershire. The officer managing the application is James Knightley, james.knightley@nwleicestershire.gov.uk. If you object to this application it is important to say this in your response (rather than just saying you are commenting). They are giving August 28th as the deadline – which is very short during the holiday season. It is important to respond to this stage – any comments you made to the developers will not count at this stage. An article in the Leicester Mercury includes some of our objections to this application. We will post additional basis for objection here shortly. IM Properties undertook a pre-application consultation on a huge ‘employment park’ at Junction 11 of the M42. It is on the countryside between the A444 towards Burton and the road to Tamworth. It reaches halfway to No Man’s Heath in one direction and Stretton en le field in the other (240 acres). There were consultation events in Measham and Appleby. If you have missed them you can see the information boards they presented here. But this is their presentation – we now have fuller details via their application documents. North West Leicestershire District Council have recently adopted a new local plan. This designates this land as countryside. It is not allocated for employment development and does not meet the criteria for new sites. We have a nearby appropriate employment site in Measham. Local Plan policies say that any land to be allocated for new employment uses has to be accessible by a choice of means of transport. This site is only accessible by car. There is no public transport to the site from any places where employees are likely to live. All the roads around Junction 11 are already congested on a regular basis. The developers are working on the assumption that the site will create 3,000 jobs and this will mean that between 7a.m. and 7p.m. there will be 5,667 car and 1,116 HGV movements. For some reason these assumptions don’t appear on their information boards! The developers say that this will not cause extra traffic problems because they will put traffic lights around junction 11. Other portions of land around Junction 11 have been sold recently under the label of ‘Strategic Land’. If the IM development goes ahead we can expect more applications at other parts of the road junction. With the disruption at the Junction promised by HS2 the chances of attracting high quality tenants for this site is questionable. Consultation responses to the developers are required by 5pm on 28th July 2018. You might also want to tell the Parish Council what you think.